Areas of CONSIDERABLE danger exist on many slopes in the mid and upper elevations with a MODERATE danger down low. Some avalanches may be triggered at a distance or from below. Avoid being on or beneath the heavily corniced ridgelines. Here's the deal: It's a complicated snowpack situation right now where even very experienced people are getting surprised. Ski and ride non wind-drifted southerly facing terrain before any warming occurs. Ski and ride low angle sun and wind sheltered terrain not beneath anything steep. Skies are mostly cloudy with temperatures already 15°F warmer than they were yesterday morning. Warming aloft (now low single digits and low teens) and backing winds to the southwest (now 15-20mph at 10,000' and 25-30 gusting 47 at 11,000') signal another storm on the horizon. Let me amend that. Many storms on the horizon. For today, we'll have mostly clear skies with some high clouds moving in overhead. Temps will rise to the low teens up high, the low 20s down low. Winds will continue to increase from the southwest as the day wears on with hourly averages pushing to 25-30mph by early eve. Greg's Week in Review just published HERE. Numerous skier triggered avalanches reported in the backcountry yesterday in the central Wasatch with a number of involvements and catch and carries. 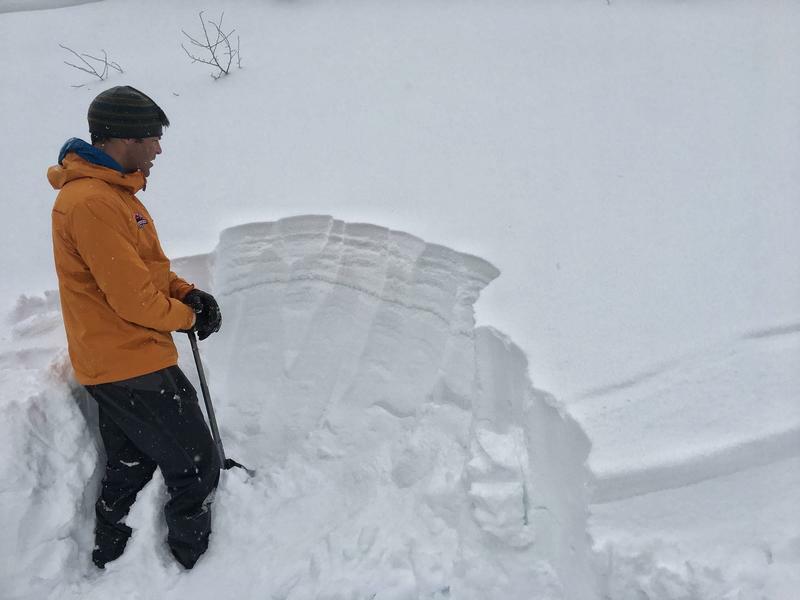 Central Wasatch ski area and UDOT avalanche control teams continue to trigger large avalanches (with and without explosives) in their terrain with some stepping to the ground in high northerly terrain. Matthew Turley captured (pc) another vantage of the avalanche(s) in Primrose Cirque (above Aspen Grove) that released mid-week. UDOT forecasters also noted many new avalanches below the Cascade Cirque and above Stewart's Falls also from the same time frame. Wind loading from a new direction will present the backcountry traveler with scattered drifts on nearly all aspects at the mid and particularly upper elevations. The new drifts - like yesterday's - will still be sensitive and based upon weak layer crystal type - may be triggered from a distance. These are soft slabs up to 12-18" deep and tend to respond well to ski cuts and cornice drops when they are predictable and obvious. If they can still be triggered remotely (at a distance), all bets are off. Approach steep wind drifted terrain with caution. Weak surface snow and patches of surface hoar buried Saturday night. This layering has likely been the culprit in at least four avalanches from Murdock Peak east to 10,420' along upper Mill Creek to BCC. These have been 1-3' deep on wind drifted north to northeast facing slopes with elevations from 8800' to 10,200'. Some of these have run naturally, some of been triggered at a distance. Cracking/collapsing are key indicators here; snow pit tests should also be reliable indicators for intended terrain - look for the 'thin grey line' a couple feet down in the snowpack (pic below). Caution should be observed as these may be triggered on approach or from below. 2. Enough snow and wind have tipped the balance in some areas to produce avalanches down near the ground 3-6' deep. These will be much more prominent in terrain that has avalanched previously this winter and may require more of a significant trigger to snap the rubber band. The large slides along the Park City ridgeline on Tuesday, and the Little Water Peak slide on Monday (observation) highlight this problem. These slides were triggered from cornice falls and were on steep, wind-loaded slopes facing northeast. Tuesday's natural from South Monitor highlights how large these avalanches can be. (pc: Mark White). In contrast to the more shallowly buried weak layers, cracking and collapsing are unlikely to be present and snow tests may be highly variable. These are lower-probability high consequence. Photo from control work yesterday. One large large collapse was noted on an east facing aspect at 8400'. Not a good sign. It's a touch outdated, but looking at the Avalanche Problem Toolbox will also provide good details and travel advice on these two types of avalanches (previously Persistent Slab and Deep Slab) . Point of Fact: I expect both dry and wet sluffing today in the most recent low density snow. Each are predictable and more easily managed but complacency leads to accidents. Loose Dry: Lower density cold smoke will sluff with provocation and perhaps naturally on the steepest terrain of all aspects. Loose dry snow avalanches can pack quite the punch and entrain lots of snow in steep, sustained and enclosed terrain (couloirs and gullies). Ski cuts are effective but it's key to continue from area of safety to area of safety, moving across the slope. Loose Wet: despite sub-freezing temperatures, the warming temperatures and direct sun will dampen and destabilize the recent low density snow on the steepest sunlit slopes. Keep an eye out for rollerballs and dampening snow and avoid steep southerly terrain by midday/afternoon. It's a touch outdated, but looking at the Avalanche Problem Toolbox will also provide good details and travel advice on these two types of avalanches (previously Loose Wet and Loose Dry) .